I’ve almost neglected this little blog over the summer. It’s not been far from my mind but I’ve just been too busy with the children to actually get anything written and up. 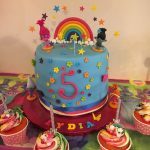 But I did want to share with you a party we threw for our little girl when she turned five at the end of July. 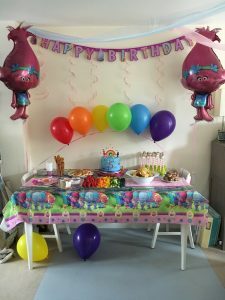 I always ask the children what theme they’d like for their parties, I think it’s important that it’s something they’ve chosen: it is after all, their party. 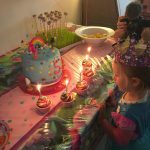 Lydia decided a few months before her birthday that this year she’d like a Troll party, based on the Dreamworks film, ‘Trolls’. I didn’t hesitate in agreeing with her as the colourful movie allowed us to have so much fun with lots of rainbow colours. Again, I kept it as simple as possible by buying all the decorations from Amazon and making sure I bought the disposable Troll themed plates, cups and tablecloth, ready to be tossed in a bin at the end. If you want to see my tips on keeping a party simple, you can click here. The cake was not my finest hour. When I’m not manically running around after children, baking is what I love to do and I’ve always prided myself in making the children’s birthday cakes. 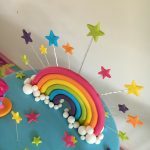 I had grand ideas to make a rainbow piñata cake to add to the multicoloured theme but the cake layers were a little big and with the piñata hole in the centre, it lacked structural integrity and rather subsided the night before the party. I smothered it in edible sparkles and rammed some kebab sticks through it for stability and we had a happy daughter, but it didn’t stop me from being disappointed. It wasn’t the cake I had envisaged making and I knew it was far from my best efforts. 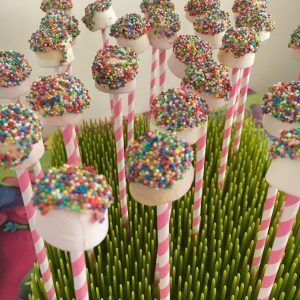 These marshmallow pops were so quick and easy that my two year old helped make them and we then used my Boon drying rack to display them! And in true British style, the weather was appalling and it rained heavily all afternoon. I had planned a bubble machine and a Troll hunt out in the garden but it wasn’t to be. It didn’t put a dampener on things though, we just partied inside with some traditional party games like ‘Pass the Parcel’, ‘Musical Bumps’ and ‘Musical Statues’. So there we have it, a very bright and multicoloured party, fit for any Troll fans out there. The birthday girl enjoyed it so much she sobbed her heart out going to bed because she was so sad it was over. Next year I’m hoping to encourage her into having a party with her friends but we shall see!